These biotechs are poised to surge higher in the years ahead. If you're searching for growth stocks with the potential to produce life-changing returns on capital, I think the biotechs Agenus Inc. (NASDAQ:AGEN), Amarin Corp. (NASDAQ:AMRN), Cara Therapeutics (NASDAQ:CARA), and Geron Corp. (NASDAQ:GERN) are all highly promising. Besides benefiting from the growing and aging global population that's already driving a hefty surge in demand for healthcare services in general, each of these biotechs sports a unique product -- or product candidate -- that could become an important advancement in their respective areas. Analysts' high-end price target for the clinical-stage biotech Agenus implies a whopping 264% upside potential for this stock. And even the stock's more modest consensus price target suggests that Agenus' shares could basically double (106% upside potential) within the next 18 months. Why is the Street so hot on this stock? The short story is that Agenus' broad pipeline of anti-cancer checkpoint inhibitors is starting to move into the human trial phase of its life cycle. As such, the company could have a novel cancer drug on the market by 2020 at the earliest. Perhaps the best part of this story, though, is that checkpoint inhibitors have an unusually strong track record in the clinic, suggesting that Agenus will eventually hit pay dirt with this line of research. As an added bonus, Agenus recently amended its checkpoint inhibitor licensing agreement with Incyte, thereby reducing its cash flow and extending its cash runway deep into 2018. So the company won't need to tap the public markets in the near term for additional capital. In all, this small-cap biotech has multiple shots at breaking into the high-value immuno-oncology game, a respectable cash position, and the backing of a major partner. Even though the dyslipidemia (above-average lipid levels) drug market is presently in free fall due to the entry of generic versions for several top-selling drugs, the actual demand for cholesterol-lowering drugs is still growing at a healthy clip because of the global obesity epidemic. And this favorable tailwind is the primary reason why some analysts think that Amarin's shares could appreciate by over 200% in the next 18 months. In a nutshell, Amarin's shares have the potential to explode higher if the company's FDA-approved fish oil pill, Vascepa, produces a positive result in its ongoing cardiovascular outcomes study called REDUCE-IT. Vascepa's target market, after all, could skyrocket to around 70 million patients with elevated triglyceride levels, suggesting that the drug's sales could reach well over $2 billion. To put this growth opportunity into the proper context, Vascepa generated right around $130 million in sales last year. Of course, there are no guarantees when it comes to clinical trial readouts, and a negative result in REDUCE-IT may lead to a noteworthy drop off in Vascepa's sales moving forward. Either way, Amarin's next REDUCE-IT update that's expected to released in either the third or fourth quarter of this year should be a major catalyst for this small-cap biotech. 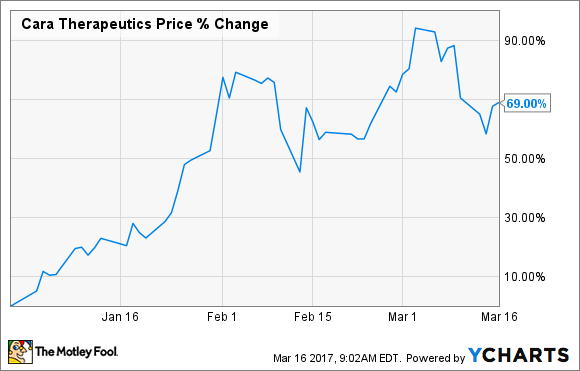 Cara Therapeutics: Is morphine on the way out? The highly addictive nature of mu-opioid based drugs -- like morphine and hydrocodone -- has spurred an avalanche of research into pain therapeutics over the last decade. Even so, the pharma industry has yet to find a suitable alternative to opioids in either the acute or chronic pain settings. Drugs that selectively target kappa opioid receptors, though, may provide a novel solution to this problem. In theory, kappa opioid receptor-based drug candidates should provide similar levels of pain relief compared to traditional opioids, but with a far lower potential for abuse. As an added bonus, these next-generation pain medicines should also generate fewer unwanted side effects, such as respiratory depression and nausea. And that's where Cara Therapeutics comes into the story. Cara is attempting to grab a significant chunk of the $60 billion pain management market with its experimental kappa opioid receptor drug candidate CR845. CR845 is presently in a midstage trial for chronic pain stemming from osteoarthritis, and a late-stage trial for acute pain in the post-operative setting. Both of these trials are nearing important data readouts -- which appears to be the reason underlying why this stock has been bolting higher since the start of the year. The key takeaway is that Cara may be close to bringing a disruptive new pain medicine to market, and that's a big deal for a company with a market cap currently under $430 million. The catch, however, is that similar kappa-opioid based drugs have produced their own set of unwanted side effects in preclinical studies, implying that CR845 may yet run into problems from a safety standpoint. So, Cara and its lead drug candidate are far from home free, so to speak. Geron's fate depends squarely on the clinical progress of its lead -- and only -- drug candidate, imetelstat. The condensed version of the story is that Geron gutted its operations, and subsequently handed off the developmental duties for imetelstat to Johnson & Johnson (NYSE:JNJ) due to its own lengthy history of clinical missteps that essentially crushed early shareholders. Imetelstat, though, may turn out to be the company's saving grace. After all, J&J has a better-than-average track record when it comes to picking out promising early stage cancer drug candidates, and the company has even gone as far as listing imetelstat as one of its next potential blockbuster products. And if J&J does strike gold yet again with imetelstat, Geron would probably fetch an enormous premium -- relative to its current valuation -- from its partner via a buyout. The good news is that the moment of truth for Geron and imetelstat appears to be close at hand. J&J is reportedly gearing up to perform a second internal data review of the drug's ongoing trials for the hematological disorders myelofibrosis and myelodysplastic syndrome, respectively. The two companies are expected to release a brief outline of these reviews by the end of the second quarter of 2017. Now, the key issue to understand is that this upcoming catalyst has multiple possible ramifications for imetelstat's clinical program. For instance, J&J may decide to sally forth with these trials as planned, modify the trials in some manner, or, in a worst-case scenario, abandon the drug's development altogether. So while imetelstat's probability of success at reaching the market may become a lot clearer after these forthcoming reviews, Geron's near-term valuation probably won't improve dramatically unless these reviews are overwhelmingly favorable. Unfortunately, the most likely scenario appears to be a mixed bag of news, based on imetelstat's performance so far. But that doesn't mean that Geron and imetelstat won't ultimately turn out to be winners over the long term.